There is nothing exciting about watching an underwater scuffle between divers. Maybe when technology was only just advanced enough for this to happen or when this was something that hadn’t been on the screen before but not today. It is a shame then that so much of the story in Thunderball relies on underwater scenes and that the “finale” takes place underwater too. This isn’t the first of the issues with Thunderball. It feels like a mess of a Bond movie, with lots of key elements that don’t really fit together. We get the return of Spectre but still no actual villain. Instead, we get quite a tame villain, something very noteworthy after the excellent Goldfinger from Bond’s previous movie. 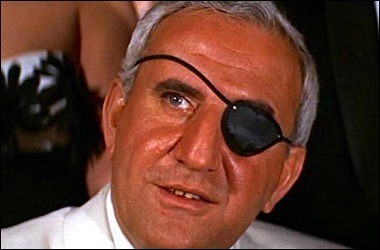 It’s not that there is anything too poor about Adolfi Celi’s Largo, it is just that it takes more than an eye-patch to make a convincing villain. His plan seems quite tame compared to what has gone before – just a simple theft of Nuclear weapons. Solid villain but he’s no Goldfinger! The film doesn’t exactly start on such a positive note anyway. The now integral opening scene, where Bond is mid-mission and setting-up the rest of the film, has the silliest and most awkward climax so far – the rocket pack! This is just another example of how the movie has aged poorly and it is the beginning of Bond getting silly – not something you’d have said about Dr No or even From Russia with Love. Some of the old magic is still apparent. Sean Connery is so comfortably Bond that it will be difficult to see anyone else playing the part. He oozes the required confident, machismo and attitude required to be the super-spy. That extends further to the Bond girl too. Claudine Auger is great as Domino and her story starts well, particularly highlighting a more creepy side to villain Largo. Unfortunately the movie soon side-lines her character and she becomes another person for Bond to save. There are even some decent set-pieces. The beginning of the movie is in a health-club and has some decent scenes using the equipment for torture. It also highlights Bond as the hero and Lothario that we have come to recognise. Unfortunately, this sequence is never really matched and the rest of the movie fails to live up to the first act. Somewhere in the planning for the movie, someone decided this was an underwater movie. This causes issues because this isn’t done very well at all. The first sequences, with Bond fighting two or three people while scuba-diving under Largo’s boat are pretty decent but hardly thrilling. When two armies decide to take each other on in what feels like a twenty-minute slog, the movie becomes a real chore to watch. There is little you can do with scuba diving fight sequences other than two people rolling around or getting shot with a harpoon gun – both things we see many times. It doesn’t help that this counts as the movies “finale.” The build-up and story isn’t that exciting in Thunderball anyway so when it all culminates in this poor finish, it leaves the movie feeling below-par. Overall, apart from the opening scenes in the health spa and Sean Connery as fine form as Bond once again, Thunderball fails to capture the magic that Goldfinger demonstrated so well. It relies too much on it’s underwater sequences, which are never more than really dull and slow. Add to this a pretty generic villain, with a dull scheme, and you get the poorest Bond movie so far.